The City of Ten Thousand Buddhas celebrated the 16th Annual Honoring Elders Day on Saturday, November 17. There were performances (traditional dances, orchestra, drumming, and songs) by students from 9:00-10:30 am, and a delicious vegetarian luncheon served from 11:00 am-12:30 pm with more performances. This year's program featured a performance by Shaolin monks based in Oakland. Each autumn, CTTB invites local senior citizens to a heartwarming celebration of Honoring Elders Day. Students of Instilling Goodness Elementary and Developing Virtue Secondary Schools put on their performances to welcome their special guests. The kitchen staff prepares and offers the seniors a scrumptious vegetarian meal. The Commemoration of the Twelfth Anniversary of the Venerable Master Hua's Nirvana was held in CTTB on June 23. The commemoration ceremony started in the morning. Participants proceeded to the Hall of No Words to pay respects to the Venerable Master's relics and sharira. The Buddha's and the Elder Master Hsu Yun's sharira are also displayed in the No Words Hall which is open only during special Dharma assemblies. After that, the grand meal offering began. 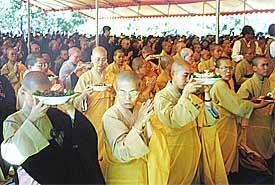 Vegetarian dishes and other items were offered in memory of the Venerable Master. The main dining hall and side halls were packed with the devotees during lunch. In the evening, a DVD introducing the Venerable Master Hua and his talks were shown to the assembly. On June 25, the Lay Bodhisattva Precepts Transmission Session started in CTTB. There were 93 preceptees. The Buddhist Sutras and publications on the Dharma that appear in this web site can be purchased in the Book & Gift Store at CTTB and its related branch-Wayplaces. Or one can order them online by visiting the BTTS web site at: http://www.bttsonline.org. Jyun Kang Vegetarian Restaurant: "Jyun Kang" means "To Your Health." CTTB's Jyun Kang Vegetarian Restaurant provides natural and healthy vegetarian dishes that taste great without MSG, onions, garlic, scallions, leeks, shallots, or eggs. The DRBA 2007 Calendar (pdf). December 22, evening: Purify the Boundaries for Amitabha Buddha Recitation. December 23: Celebration of Amitabha Buddha's Birthday. December 22 - December 29: Amitabha Buddha Recitation session. 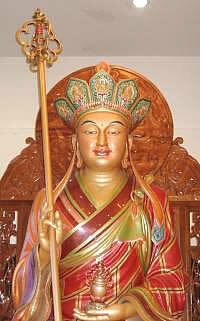 Amitabha Buddha is also known as “Amitayus”. “Amitabha” means “infinite light” and "Amitayus" means "limitless life". He is the Buddha of the Western Land of Ultimate Bliss. The three Pureland Sutras: The Larger Sutra on Amitabha, The Smaller Sutra on Amitabha, and the Contemplation (visualization) of Amitabha Buddha Sutra. Countless eons ago, Bhikshu Dharma Treasury made 48 inconceivable vows before Lokesvaraja Buddha. He vowed that his Buddhaland will be the most blissful and pure; that all who are born there will advance irreversibly to Buddhahood. Bhikshu Dharma Treasure is now Amitabha Buddha. 1. Mindfulness of the Buddha through reciting his name. 2. Mindfulness of the Buddha through contemplating his image. 3. Mindfulness of the Buddha through contemplation. 4. Mindfulness of the Buddha’s real appearance. And be born in his Land of Ultimate Bliss and Peace. Chan session: A three-day Chan Meditation session begins on November 5 to 7, 2007. Chan: The Essence of All Buddhas. November 12, 2007: DRBA Annual Sangha Meeting. The City of Ten Thousand Buddhas will be celebrating the 16th Annual Honoring Elders Day on Saturday, November 17. There will be performances (traditional dances, orchestra, drumming, and songs) by students from 9:00-10:30 am, and a delicious vegetarian luncheon served from 11:00 am-12:30 pm with more performances. This year's program will feature a performance by Shaolin monks based in Oakland. Another Chan session: November 22, evening: Introduction to Chan meditation. This Chan session begins from November 22 to 25. 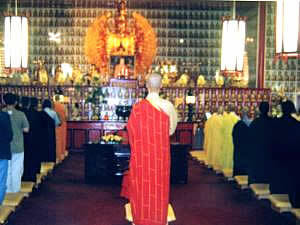 October 27, 2007, evening: Purify the Boundaries for the Gwan Yin Session in the Buddhahall at CTTB. October 28, 2007: Celebration of Gwan Yin Bodhisattva's Leaving Home day. Gwan Yin Recitation begins from October 28 to November 3. During this session, the Universal Door of Gwan Shr Yin Bodhisattva (a chapter from the Lotus Sutra) and Gwan Yin Bodhisattva's sacred name is being recited everyday. Gwan Yin Bodhisattva is also known as Avalokiteshvara Bodhisattva in Sanskrit. In some parts of Asia, Gwan Yin is called the Goddess of Mercy. Gwan Yin Bodhisattva represents the boundless Compassion of all Buddhas and great Bodhisattvas. He is also known as the "Bestower of Fearlessness." There is a Gwan Shr Yin Bodhisattva inside the mind of every living being. As we recite and recollect Gwan Yin Bodhisattva, we're simply recollecting the Gwan Yin Bodhisattva inside our minds." Gwan Shr Yin is pure and sagely. A Dharma talk by the Venerable Master Hua: Gwan Yin, Gwan Yin, Gwan Shr Yin. September 8, 2007, evening: Purify the Boundaries for the Earth Store Session in the Buddhahall at CTTB. September 9, 2007: Celebration of Earth Store Bodhisattva's Birthday. Earth Store Recitation begins from September 9 to 15. During this session, the Sutra of the Past Vows of Earth Store Bodhisattva and Earth Store Bodhisattva's sacred name is being recited everyday. Earth Store Bodhisattva is also known as Earth Treasury King Bodhisattva in English, Ksitigarbha in Sanskrit, and Ti Tsang Wang Pusa in Chinese. Shortly after the birth of Prince Siddharta (the Buddha), his mother, the Lady Maya passed away and ascended to the heavens. After Prince Siddharta had cultivated for several years and become enlightened (a Buddha), he spoke the Dharma extensively for more than four decades. Towards the end, the Buddha, wishing to repay the kindness of his mother, ascended to the Trayastrimsha Heaven and spoke Dharma on her behalf. The Dharma that the Buddha spoke then is known today as the Sutra of the Past Vows of Earth Store Bodhisattva. This Sutra is also known as a Sutra of great filial piety. "As long as the hells are not empty, I will not become a Buddha. When living beings have all been saved, I will attain to Bodhi." The Venerable Master Hsuan Hua explained the meaning of "Earth Store" (Ksitigarbha) by describing ten aspects of the earth: "It is wide and extensive, it supports all living beings, it is impartial, it receives the great rain, it produces grass and trees, it holds all planted seeds, it holds many treasures, it produces medicines, it is not moved by the blowing wind, and it does not tremble at the lion's roar. The living creatures of the darkness--all receive his light. Immeasurable and infinite are the powers of his vows. Homage to Earth Store Bodhisattva Mahasattva of Great Vows and Boundless Compassion. The Buddha spoke the Ullambana Sutra to rescue beings in difficulty and to help living beings' parents and their parents of seven lives past. On August 26, Sunday, CTTB held its annual Ullambana Celebration Day. The Buddha Speaks the Ullambana Sutra was recited three times in the morning. Then the great assembly chanted the "True Words for Repaying Parents' Kindness."